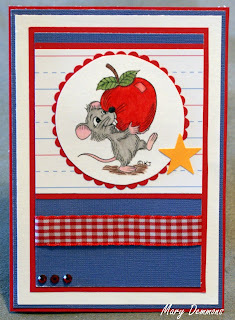 I created this back to school card using Apple Of My Eye from Karen's Doodles. The sketch I used is from The Sweet Stop. The base of my card is white card stock backed in blue card stock and then again in red card stock. I added a block of primary lined school paper card stock, backed it in red and then added it to a strip of blue. I added a red gingham ribbon to the bottom of the strip of blue and backed it in red card stock. I added 3 red rhinestones to the left bottom corner under the ribbon. I colored the image using crayola and prisma colored pencils. I cut the image out in a circle, backed it in red card stock and then cut around it using scalloped scissors. I added a yellow star to the lower right of the image. Holy smokes! That apple SHINES! Great coloring! Love the color scheme! Thanks for playing along with us at the Sweet Stop this week! I love this Bigsby imaged card. Your colouring is super along with the layout. Thank you for joining us at Karen's Doodles this week and good luck. What a sweet card! Great job combining all of those challenges! Thanks for making Catch the Bug one of them. Good luck in the prize drawing and please do join us again. Great colouring Mary, a delightful card. Oh how sweet, what a cute image and perfect for a teacher card! What an adorable back to school card! The primary colors are perfect and the cute image is wonderfully colored! Thanks for playing along with us at The Sweet Stop this week! What a super cute card Mary. Love the cute image. That apple looks great! Perfect papers. Thank you for playing along with us at The Sweet Stop. Thank you so much for playing our challenge this week at OSAAT. Good luck. Great card, thanks for joining us at OSAAT this week. FABULOUS! Love the back to school card with Bigsby! I love it! Wonderful to see Karen's images. Thanks for joining us at Karen's Doodles! Oh so cute, love the colors. Thanks for playing at Catch-The-Bug this week. What a CUTE CUTE card!! So cute! love that bright bright red apple! Oh my goodness this is absolutely adorable! Thanks for playing along with us at Jens Digi Stamps. Brilliant card so sweet Thanks for joining us at Papertake weekly. I Even Love The Box!